I wanted to gather and preserve recollections of what it was like to return to France after the war. I had no idea that I would be writing a book. I merely want to preserve the memories of what life was like when, as children, we followed our parents back to France in 1946. Once the war was over we wanted to carry on as before, but life isn’t like that. I have been writing these memoirs for over thirty years; I had been a story teller as a child, but I had to relearn the skill and also learn to construct a narrative. I didn’t have an audience in mind. I just wanted to craft something to be proud of, to show myself I could do it. Writing was a place where I was happiest. Then the stories became about sharing with my nephews and niece and their children who never got to know their grandparents. A chance to share the times we lived through. I hope I live long enough to finish another volume, a sequel of sorts, about life in the Creuse, the home of my French family. I did plenty of “research” once I started collecting the stories with my sisters. Putting our joint memories on the computer when I retired from the World Bank seemed perfectly natural. 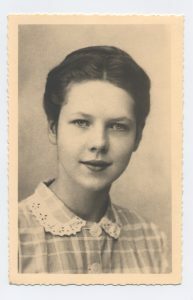 My mother was a writer, and her letters to her American family and French in-laws were a major source of the memories I have related. I spent hours at the Library of Congress reading up on France during and after WWII. I taught history; I am a storyteller. I used to entertain my two younger sisters for hours in the warm coal cellar telling stories. They were a perfect audience when we had no television or computers, and hardly any heat in postwar Paris. I also grew up in France where writing well mattered. Being French in America set me apart, I was cruelly teased for being different during WWII. As a refugee child, I had rocks thrown at me. Nevertheless my home on the Hudson was my happiest, though I never have wanted to go back. It is a closed door. I returned to Paris again and again, though now all the friends and family are dead. As a child, France seemed to be a country of war and death, but it is part of me. But now, I am most comfortable in the United States, and English has become my first language, the one I write in. Operating a family owned business is, of course, sometimes a challenge; but, for the most part, it is very rewarding. A project came to us that was more than just rewarding; it was absolutely a pleasure for all involved. Recently, I had the privilege of working with Marie Christine “Micki” Garland and her daughter Kate. Micki had created a memoir of her life, In the Shadow of War. It tells of her childhood as a French refugee, coming to the United States just as WWII was starting in Europe in 1939……Then moving back to France after the war – with all of the emotions of orientation in the US then the orientation back in France. It was such a pleasure to work with such a bright, talented individual with superb organization and writing skills. 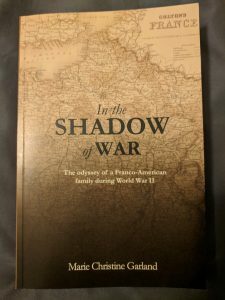 All of our staff that came into contact with her to polish the design and technical aspect of printing the book marveled at her skills to create a book of such historical interest and so beautifully written. She gave us all a lesson in what can be accomplished with a lifetime of dedication. The outcome was beautiful. We at Mpress received our reward by living Micki’s life with her as we all helped put the book together. It was a proud moment for us all. Then to top it off, she informed us that she is working on finishing up her next memoir, documenting her later return to America.